This high performance transmission trap door is machined from high strength billet aluminum and polished to a show quality finish. Kit includes the trap door, beaings, all required hardware, and instructions. 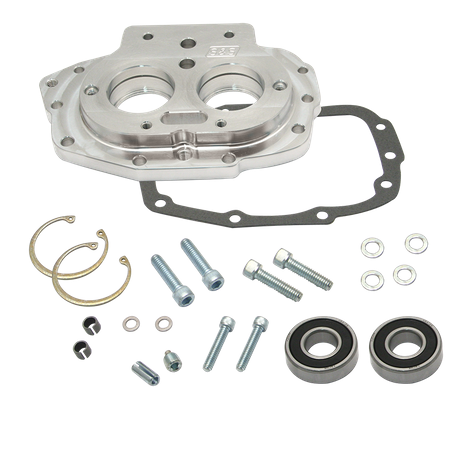 Fits 1986-'99 stock transmission cases, and is perfect for the S&S 4 to 5-speed conversion transmission case. S&S trap doors are of the 1987-’99 style. S&S recommends using this style trap door and end cover with the "ball and ramp" clutch actuator. The strength of the earlier, lever-type actuator is marginal for heavy clutch springs sometimes required in high-performance applications.